The stock market outlook remains in uptrend territory to kick off the first week of spring. All eyes will be on the U.S. Federal Reserve this week; another quarter-point rate hike is expected by the end of their 2-day meeting. 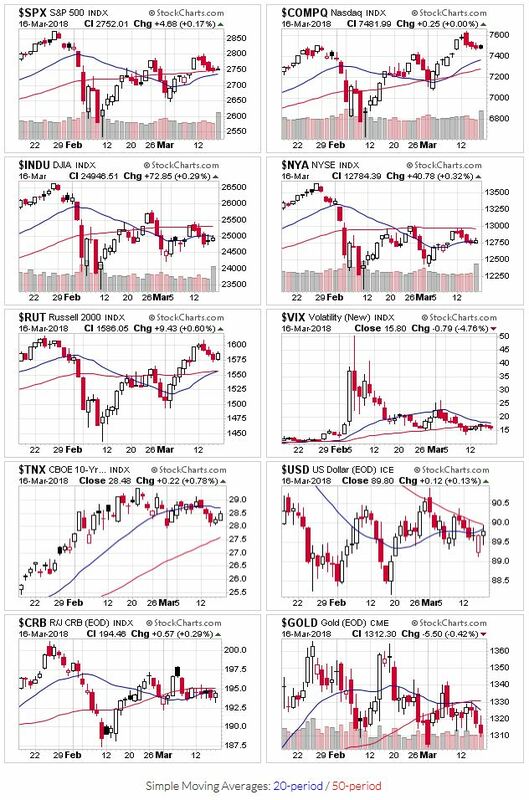 Most of the indexes remain above their 20 and 50 day moving averages. The DJIA lags other averages, sitting below both those technical indicators. Price and volume action also stays in uptrend territory. The distribution day count remains manageable. Note: Trading volume spiked last Friday on option / futures contract expirations. After a January all-time high of SPX 2873, ending a strong 10-month uptrend. A drop of nearly 12% in two weeks followed. The perma-bears were back out in force. The crash they keep calling for has already occurred: 2007-2009. Those types of events only occur once in a lifetime. There will be bear markets in the future. But nothing like that for a very long time. I’m looking for a potential replacement for the 20/50 day moving average; an indicator that works well when markets are volatile and/or extended from trending indicators such as moving averages. The Average Directional Index (ADX) caught my eye because it flashed a sell signal for the $SPX just ahead of the February sell off. At the moment, it’s showing a bearish environment (DI- is higher than DI+) that’s weakening (ADX is declining).